tightrope | D.K. LeVick's "Writing in the Woods"
He is the first person to ever walk across Niagara Falls, but there is an exciting and sometimes tainted history of men and women who have challenged Niagara over the years. In tribute to Wallenda’s feat, I’ m posting a short history of them that I had written a year ago. Sit back and Enjoy the trip! Beginning in 1827 (see “the ‘Pirate’ ship, the buffalo and the loss of innocence”) and right up to the present, people have challenged Niagara. Whether it’s the surging brink itself, the powerful whirlpool, the steep walls of the gorge above or the raging rapids below – there’s been a steady stream of human fodder offering themselves to the water god in exchange for a moment of glory. Cowabunga!! And Niagara would never be the same again as men attempted to shrink Niagara to mere background to their feats of daring and danger. But did they? Since 1827 there are at least 81 documented ‘Niagara Daredevils’ with hundreds of individual feats of bravery – valor or sheer stupidityy, since that time. Have they demeaned and shrunk Niagara? When the mighty ‘pirate’ ship “Michigan” was sent to its destruction over the Horseshoe Falls in 1827, standing in the crowds was a diminutive, young man of 20, named Sam Patch. Sam was intrigued by the thousands of people come out to witness the massacre of the ‘animal‘ crew and he shaped his destiny to become Niagara’s first stuntman. On the 17th of October, two years following the ‘Michigan’s‘ destruction, the 22 year old jumped off a platform, 130 feet high, set up below Goat Island, into the base of the Horseshoe Falls. Having to make the same decision all men face (to work for a living or not) Ol’ Sam chose the ‘not‘ and toured the country with his hand out. The cyber-age having not arrived yet, there was a shortage of digital cameras, websites, and IMAX screens, leaving him with only his mouth to promote the mighty leap. In 1829, most people didn’t know what Niagara Falls was yet (actually Niagara wasn’t labeled yet but was the ‘great falls by the City of Falls‘, now there’s some great imagination at work). Just a month after his jump into Niagara, on November 6, 1829 he attempted a shorter jump of 100 feet from the Genesee Falls in Rochester, New York. …Captain Matthew Web – the first person to swim across the English Channel in 1875. Oh, how the English press raved! He could swim anything, anywhere, anytime. Niagara? Phefff – what’s a Niagara? Born in Shropshire, England in 1848, he was the recipient of a gold medal from the Royal Humane Society of Great Britain for jumping off the steamer “Russia” to save a sailor who had been washed over board. Webb came to Niagara Falls during the Summer of 1883 boasting to challenge the Niagara River. He had been promised a $2,000 reward if he swam the Niagara River Whirlpool Rapids. On July 24, 1883 he was rowed from the Maid of the Mist landing and he slipped into the water downstream from the thunderous Falls to begin his swim through the Whirlpool Rapids. He made mighty strokes and showed the form that conquered the English Channel as he swam through the rapids in just two minutes. He truly was a great swimmer. From there things didn’t go too well. At the vortex of the Whirlpool – he disappeared. 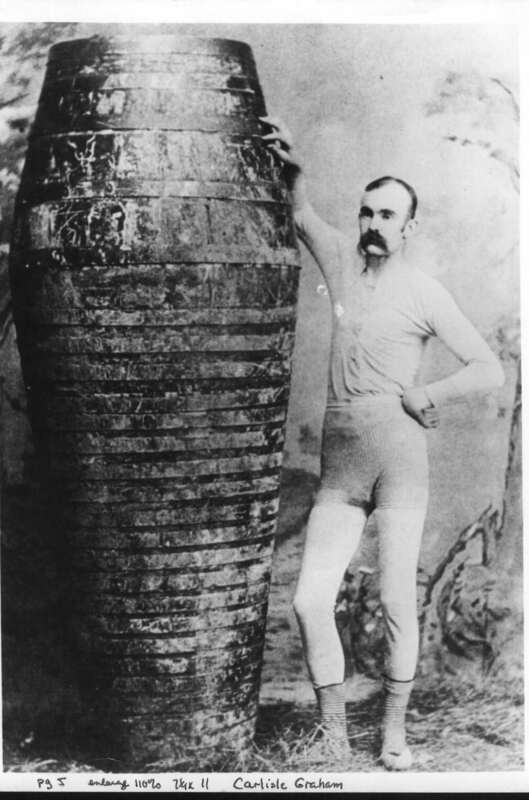 In 1886, Niagara Falls witnessed its first barrel stunt. Carlisle D. Graham, an English cooper (that’s a barrel maker for you generation ‘Xers). Graham had made a five and a half-foot barrel of oaken staves and handmade iron hoops he planned to house himself in for a trip down the rapids. On Sunday July 11th 1886 Graham began his trip from what is now the Whirlpool Bridge through the great gorge rapids and the whirlpool. Graham stood six feet tall had to stoop over once inside the barrel to allow the water tight lid to be screwed into place (why didn’t he make a six foot barrel?). The initial trip took 30 minutes. Graham survived but had become extremely ill from the ride. Carlisle Graham made a second trip on August 19th. Graham survived but sustained serious hearing loss. The next day, James Scott, of Lewiston, New York attempted to swim the rapids and lost his life. Graham made three more trips through the rapids in a newly designed seven foot long barrel. He nearly suffocated after getting caught in a whirlpool in his last trip. On September 6th 1901, Graham loaned his barrel (was there a waiting line?) to Martha Wagenfuhrer of Buffalo, New York. Miss Wagenfuhrer became the first woman to successfully navigate the rapids and whirlpool alone. On September 7th 1901, Graham arranged a double performance with friend Maude Willard of Canton, Ohio. Willard would ride the barrel through the rapids to the Whirlpool and then both she and Graham would swim the rest of the way to Lewiston. Ms. Willard entered the barrel with her pet dog for the journey through the rapids. As the barrel reached the Whirlpool it became stranded for six hours. When recovered, Maude was dead. Her pet dog jumped out of the barrel uninjured. The dog survived the ordeal by putting its nose to the only air hole the barrel had allowing the dog to breathe which resulted in Maude suffocating to death. 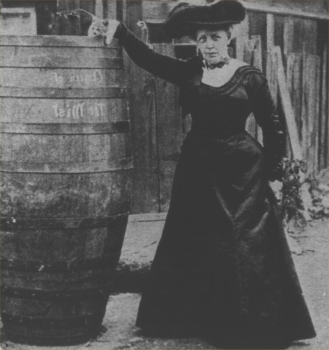 Annie Edison ‘Maude’ Taylor – Schoolteacher – looking to make some money (teacher salaries were really low back then) had a unique idea to go over the brink of Horseshoe Falls in a barrel. And so, in October 1901, the 63-year-old school teacher did just that and was the first person to go over the Falls in a barrel (canoes don’t count). She didn’t and she didn’t make any money neither. While she made some meager dollars posing for photographs and selling pieces of her barrel, her manager took her for everything she owned and left her ‘high and dry’. 3) going over the Great Falls in a barrel. On July 1st 1908, Leach jumped off the Upper Steel Arch Bridge using a parachute – 1 down. In 1910, Leach returned to Niagara Falls to ride the barrel through the Great Gorge Rapids to the Whirlpool. Leach had attached an anchor to his barrel (?) but it got stuck in the rocks (duh!) and was cut. Leach’s barrel bounced from rock to rock through the rapids before becoming stuck in an eddy in the Whirlpool. 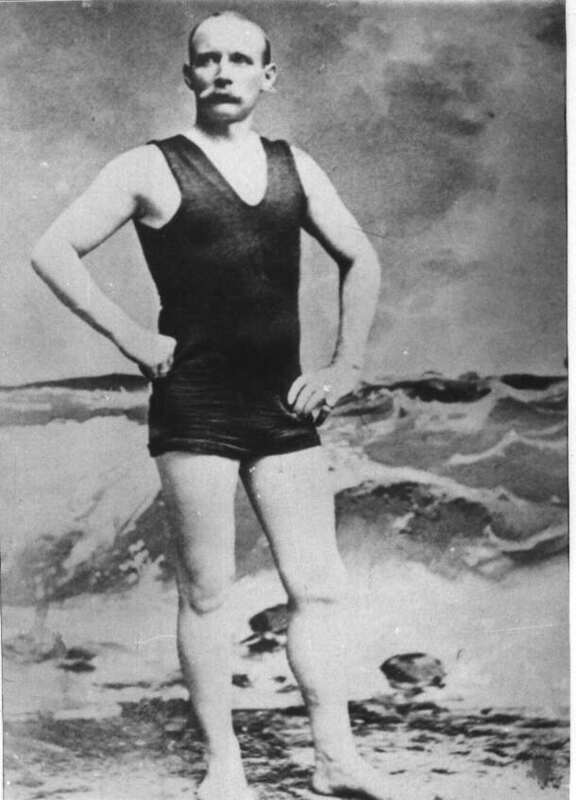 William “Red” Hill Sr. (more about him later) risked his life swimming to Leach’s barrel and dragging it into shore. Leach was removed from the barrel unconscious. Liking the limelight, ‘Red’ Hill climbed into the barrel and rode it through the lower rapids to Queenston. During that summer, Leach made the successful trip through the Whirlpool Rapids. – 2 down – 1 to go. Riding inside an eight foot steel drum, on July 25th 1911, Bobby Leach took eighteen minutes to reach the brink of the Horseshoe Falls before going over. 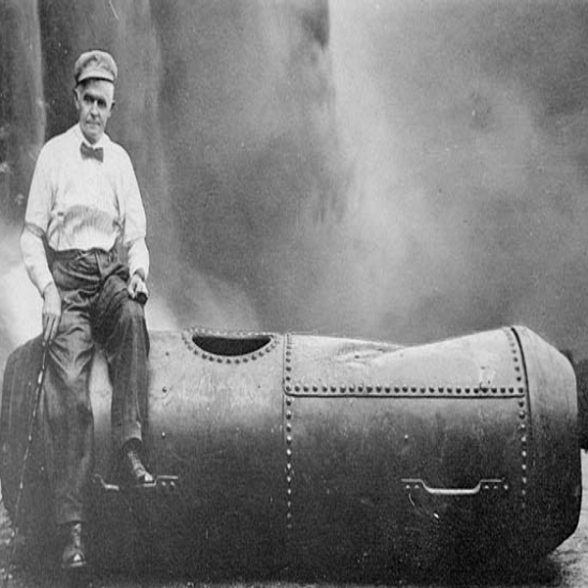 The barrel became stuck in the river at the base of the falls before Fred Bender tied a rope around his waist and swam to the barrel and tied a rope to it. Leach was removed from the drum and rushed to the hospital suffering from two broken knee caps and a broken jaw. He spent six months in the hospital recovering and then went on a publicity for his mighty deed. In New Zealand (of all places?) he slipped on an orange peel. Go figure – he died. There seemed a special attraction for watching those daring souls venture across the gorge on a thin wire rope. It was a nonstop stream of ‘rope walkers’ doing crazy things over Niagara. 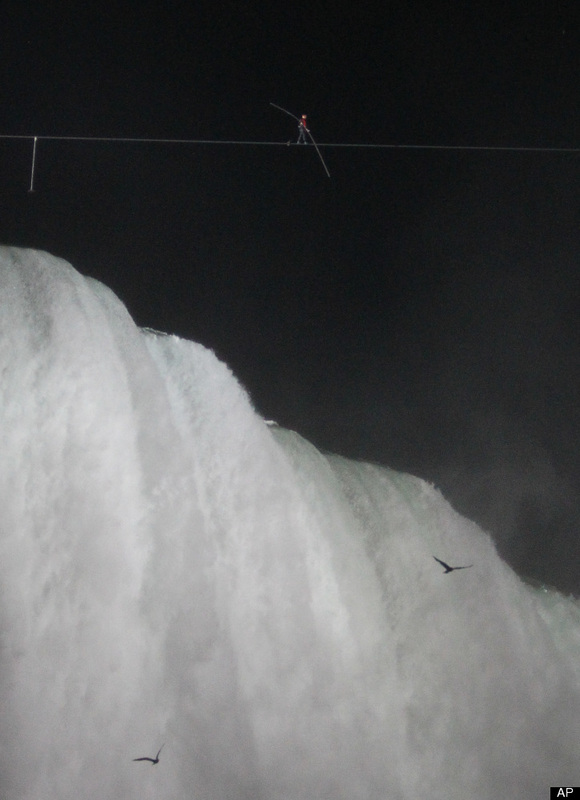 (Well, now we know that’s no longer true – on June 15, 2012 Wallenda ‘tightwired’ across Niagara! Let’s trace his forerunners. Jean Francois Gravelot, better know as “The Great Blondin” was the most famous of them all. He was born February 28th 1824 in St. Omer, Pas de Calais in Northern France. Blondin came to Niagara in early 1858. 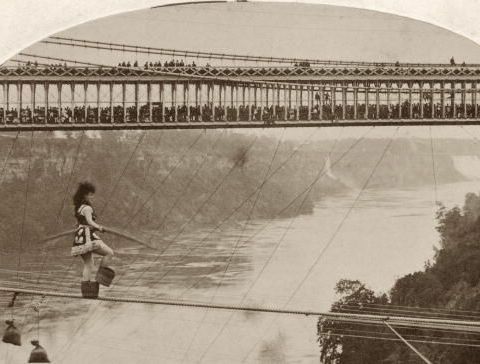 He was obsessed with crossing the Niagara River on a tightrope and on June 30th 1859, he successfully walked over the river. He utilized a 1,100 foot long – 3 inch diameter manila rope stretched from what is now Prospect Park in Niagara Falls, New York to what is now Oakes Garden in Niagara Falls, Ontario. During the summer of 1859, Blondin completed eight more crossings. He crossed carrying his manager, Harry Colcord, on his back. 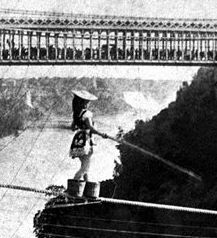 During the summer of 1860, Blondin returned to Niagara for a second successful year of tight rope walking across the Niagara River for hundreds of thousands of sightseers. His acts included pushing a wheelbarrow along as he crossed and cooking breakfast on a stove, lowering it to guests on the Maid of the Mist below. Thousands jammed the shores and climbed the trees – hoping to see him fall. The crowds actually became despondent and upset with him that he didn’t fall. What’s the matter with him – didn’t he know how to entertain? Blondin died in 1897 at the age of 73 years. William Leonard Hunt was born Lockport, New York in 1838. 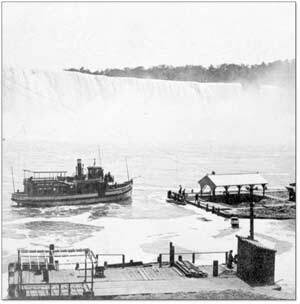 During the early summer of 1860, a young 22 year old Hunt watched intently from the shore of the Niagara Gorge as the Great Blondin made his way across on a wire. Hunt turned to his girlfriend and boasted that he could do that too. She laughed. That night, Hunt gave notice to his employer (his girl friend’s father!) that he was quitting to pursue a career as a rope walker in order to challenge Blondin. His girlfriend immediately broke off their engagement (think daddy had anything to do with that?). William Hunt changed his name to Signor Guillermo Antonio Farini (couldn’t go wrong now) and he left his home in Port Hope after his father accused him of being a disgrace to his family by becoming a circus performer (“whats the matta for you?”). He joined the Dan Rice’s floating circus on the Mississippi River and was reunited with his family after buying his father a farm (he made him an offer he couldn’t refuse). He issued a series of challenges to Blondin but they went unanswered. Blondin was a polished acrobat however ‘Farini’ was a much more powerful performer and a much better businessman. Blondin usually took a collection at the end of each performance while ‘Farini’ marketed and ticketed his performances to ensure financial success. His first performance at Niagara Falls occurred on August 15th 1860. 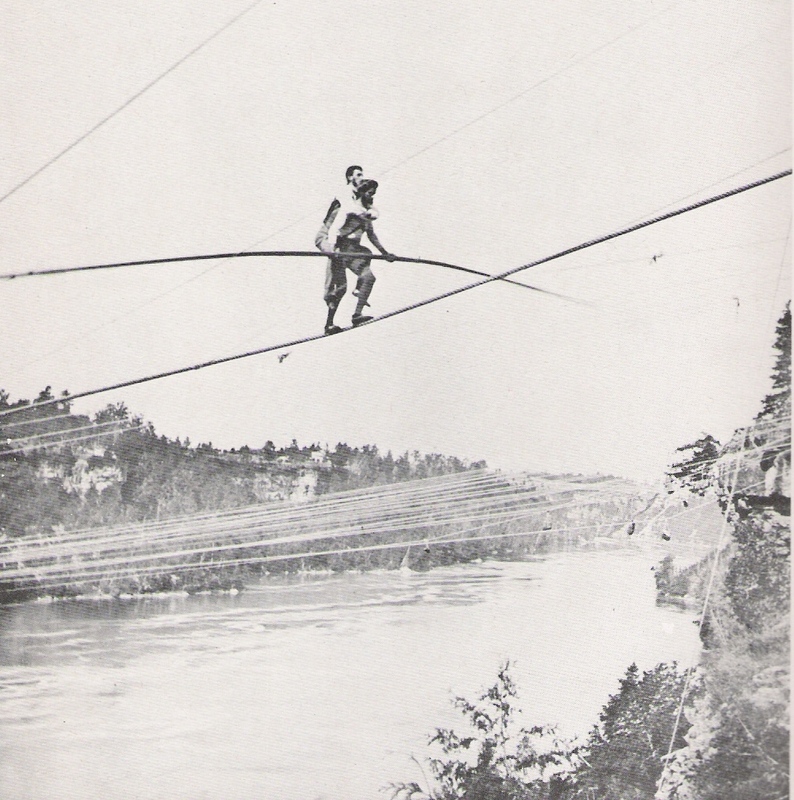 ‘Farini‘ began the tightrope walk while carrying a balancing pole and an additional coil of rope strapped to his back. 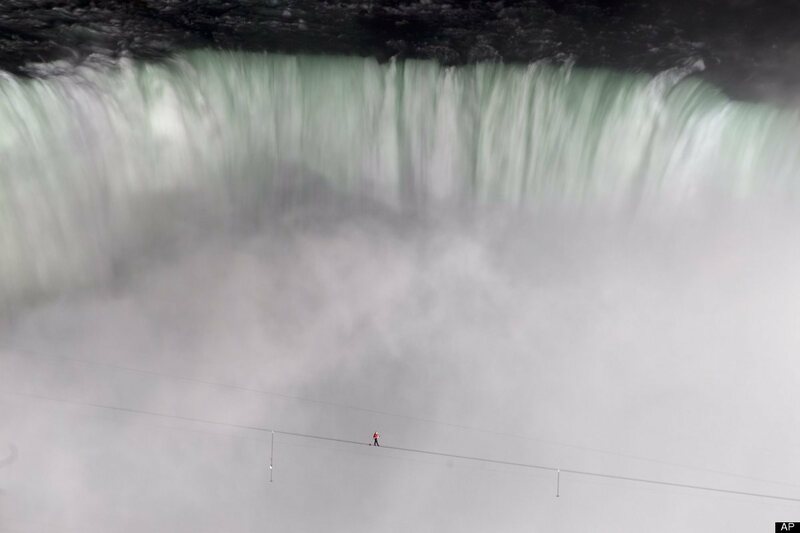 When he reached the mid-point he tied the pole to the tightrope and using the coil of rope he carried with him, Farini lowered himself to the deck of the Maid of the Mist boat 200 feet below. Getting down was relatively easy. On the deck of the boat, he drank a glass of wine before ascending back to the tightrope above. This task was much more demanding than he had anticipated and he was near total exhaustion and nearly fell on several occasions. But he did make it back to the tightrope, and continued to the shoreline. After a brief ten minute rest, he made the return crossing blindfolding and wearing baskets on his feet. He would quickly become known as “The Great Farini”. Blondin did not try to equal this feat. In the weeks that followed, Farini matched or surpassed each of Blondin’s performances. He balanced himself on his head, hung from the tightrope by his toes and carried a person across on his back. On September 5th 1860, Farini carried an Irish washer woman across the gorge on his back. 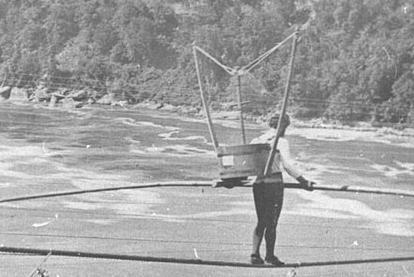 When Blondin took out a stove on the tightrope and cooked an omelette, Farini carried a washtub out on the tightrope and lowered a bucket to the river below for water to wash a dozen handkerchiefs. Farini had a passion (but still no girlfriend). Farini performed at Niagara Falls twice each week. Although his acts were more daring and drew larger crowds, he never received the attention and press coverage that Blondin received. 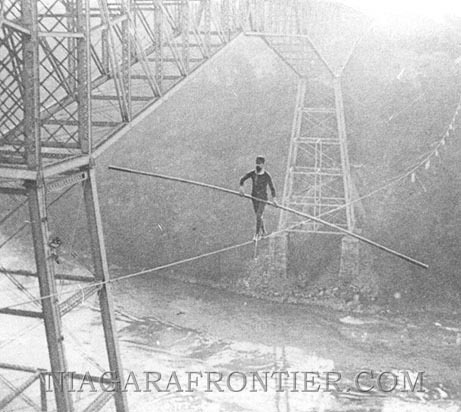 For Farini, tightrope walking was but one of his many interests throughout his life. During his life he was an inventor, an explorer, writer, secret service agent, painter and sculptor. During the American Civil War, Farini was a member of the Secret Service for the Confederate Army. 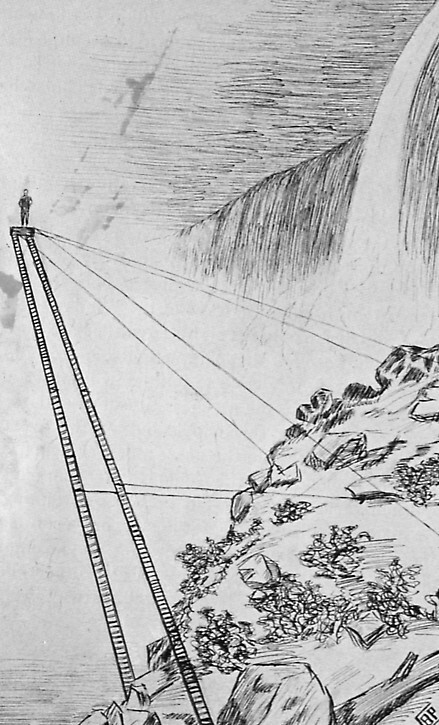 In 1864, Farini attempted another death defying feat. Wearing a pair of specially made stilts, he waded out into the cascading water just above the American Falls. Farini planned to walk to the brink of the Falls on the stilts but one of the legs got caught in a crevice in the riverbed causing it to break. Farini suffered a badly injured leg but was still able to reach Robinson Island which is nearest the Luna Falls. Here he was rescued. Farini left Niagara Falls defeated, deflated and de-dollared. The Great Farini retired to Canada in 1899 where he took up the art of oil painting. William Leonard Hunt, aka: The Great Farini died in January of 1929 at the age of 91 years. The Great Farini was one of the worlds greatest tightrope walkers ever, but to this day remains hidden behind the mystique of Blondin. And of course – let’s not forget Maria…..
Signorina Maria Spelterini (also spelled as Spelterina) was a buxom, beautiful woman of Italian descent, famous for wearing outrageous costumes. Her stunts included walking with her feet in baskets and performing wearing shackles and chains. 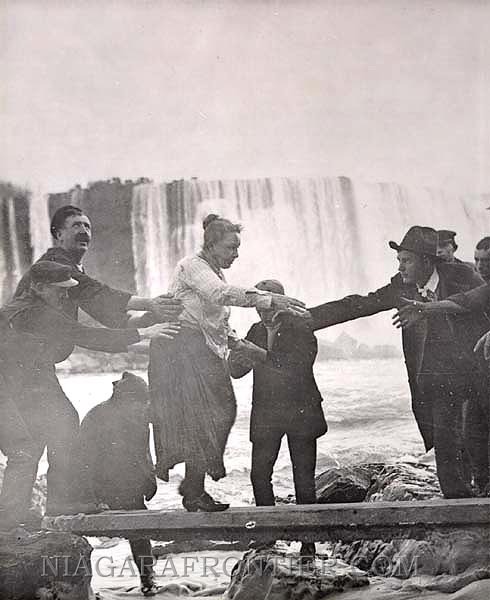 She was the first woman to ever walk cross the Niagara Gorge (as far as I know, she was the only woman too). Many of her stunts were done at the age of 23, as part of the celebration of the United States Centennial in 1876. Her final crossing was on July 26th 1876. Her personal life remains a mystery. The date and place of her death are unknown. Note in the pictures above that in one she is wearing a hat and in the other she is not – obvious proof that she walked across at least twice with buckets on her feet. An exciting, yet relatively unknown feat was done in 1846 involving the famous ‘Maid of the Mist’. The first Maid of the Mist was launched on May 27th 1846 and was not a joy ride but was a ferry, being the only method to cross the border. In 1848, when the first suspension bridge was built, the ferry was no longer required. What to do? Fold or change? The Maid of the Mist ferry boat service became a tourist boat attraction. And it was so popular, on July 14th 1854, a larger boat, the Maid of the Mist II was launched. It was a single smoke stacked 72 foot long steam propelled paddle wheeler. But alas, in 1861, due to the impending American Civil War, the Maid of the Mist was sold at public auction was sold to a Canadian Company. That is, providing the boat could be delivered to Lake Ontario. The Maid of the Mist would have to be navigated through the Great Gorge Rapids, the Whirlpool and the Lower Rapids prior to delivery. The thought was mind boggling and terrifying. Who would do it? On June 6th 1861, 53 year old Captain Joel Robinson along with two deck hands, began the perilous journey. His engineer, James Jones tended the boiler, ensuring maximum power was available. With the shores lined with people come to watch and with a short blast of the whistle, Captain Robinson and crew rode the Maid of the Mist through one of the world’s most wild and dangerous white water rapids. The first giant wave, threw the men to the deck of the wheel house and ripped the smoke stack from the boat. 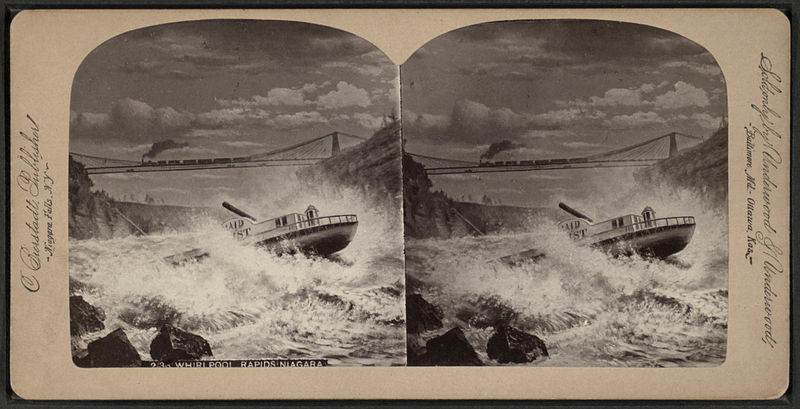 Engineer Jones was thrown to the floor of the engine room and the boat was now at the mercy of the mountainous waves crashing against and over the tiny boat. 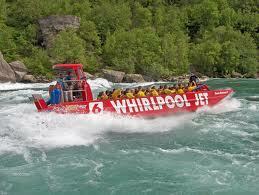 Carried by the water at 39 miles per hour through the rock strewn rapids, the Maid was propelled into the Whirlpool. The tranquility of the Whirlpool allowed Captain Robinson to regain control of his boat. Captain Robinson struggled to break the Maid from the grip of the Whirlpool before challenging the dreaded Devil’s Hole Rapids. The Captain Robinson did the best he could to steer through the channel with his damaged vessel. Stephen Peer was born in Stamford Township and was 19 years old when Blondin performed his first tight rope walk in Niagara Falls. He signed on to become an assistant to Henry Bellini (another ‘wire walker’) by helping Bellini string the rope across the gorge. Peer made his first public appearance using Bellini’s equipment but without obtaining Bellini’s consent – not cool. Bellini tried to stop Peer by trying to cut the rope, with Peer on it. Bellini was chased out of town. Peer became famous enough to begin performing under his own billing. But on June 25th 1887, Stephen Peer was found dead laying on the bank of the Niagara river directly below his wire cable. It is speculated that Peer tried an unscheduled night crossing, on a dare, after an evening of drinking. On May 30th 1930, a crowd estimated at twenty-five thousand lined both sides of the Niagara River to witness a spectacular feat performed by legendary river man “Red” Hill. Born in Niagara Falls, Ontario, now at the age of 42, Hill was going to fulfil his promise to run the Great Gorge Rapids and the Whirlpool from the docks of the Maid of the Mist. Hill Sr.’s barrel was of steel construction, six feet long and three feet in diameter with a manhole for entry. There were air holes on the sides of the barrel with were plugged with cork to allow them to be opened in an emergency. It was weighted by a steel keel consisting of a section of railroad track. 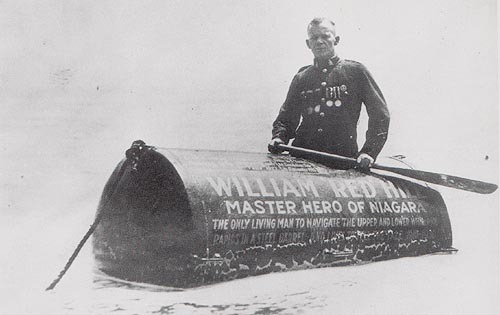 The barrel was painted bright red with gold lettering with “William Red Hill, Master Hero of Niagara” inscribed on the sides. On May 30th 1930, Hill climbed into the barrel and set off on his journey. It took one hour and forty minutes caught in the back eddies before the river released his barrel, allowing it to enter the rapids. In ninety seconds he was through and in the whirlpool, where it became stuck in the vortex. It was three and a half hours before his friends were able to free the barrel so he could resume the journey through the final set of rapids. He suffered a few minor bruises and the next day went back to work driving a taxi. This was actually Hill’s second trip through the rapids. His first trip occurred in 1910 using the barrel of Bobby Leach. On Memorial Day 1931, he made a third trip using the barrel of George Strathakis, who had died in the barrel while attempting to go over the Falls. Red Hill Sr. had officially been credited with saving the lives of twenty-eight persons from drowning. He received more lifesaving awards from the Canadian Government than any man before or since. Red Hill Sr. was the foremost expert in the knowledge of the rivers treacherous tides, undertows, whirlpool and eddies. He had grown up near the gorge and it was his playground. During his lifetime, Red Hill Sr. recovered the bodies of one hundred and seventy-seven persons who had died from accidents or suicides. Hill Sr. spent the waning years of his life showing off his barrel and selling pictures of himself in a souvenir store. On May 14th 1942, William Red Hill Sr. at the age of 54 years, died of a heart attack. William “Red” Hill Jr. felt compelled to fill the shoes of his father. He had helped on most of his fathers twenty-eight rescues. He helped his father in the recovery of 117 of 177 corpse recovered. On his own Red Hill Jr. pulled another 28 dead bodies from the river. He twice made the strenuous and dangerous swim from the base of the American Falls to the Canadian shore and he twice rode the Great Gorge Rapids and Whirlpool in a barrel. Red Hill Jr. acquired fame but the fortune eluded him. A month after his second ride, a bailiff seized all of his goods, to include the three famous barrels of the Hill family, for sale at a public auction in order to satisfy his creditors. On the last Saturday of July 1949, Hill Jr. decided it was time to restore the legend and the financial status and so he challenged the Great Gorge Rapids once again in a torpedo shaped steel barrel. The journey garnered little media coverage and no financial gain and Hill Jr. had to be hauled up the gorge in a basket and hospitalized. But his dream for a memorial to his father weighed heavily and he planned a ride over the Horseshoe Falls. Oh, how fickle are the winds of fortune! 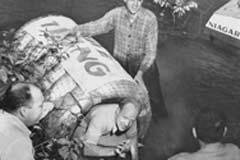 On August 5th 1951, Red Hill Jr., with no funding, built a cheap ‘barrel’ called “the Thing”. 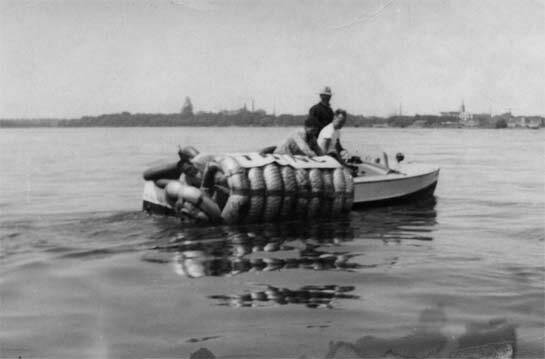 It wasn’t a barrel at all, but rather was a contraption of thirteen large heavy duty inner tubes lashed together with canvas webbing. These were encased in a heavy gauge fish netting. “The Thing” was launched on the Canadian shoreline approximately three miles upstream from the Horseshoe Falls. With Red Hill Jr. inside, ‘the Thing’ rode through the upper rapids and went over the the Horseshoe falls, was caught under the falls and the pressure of the falling water broke it apart. It was long minutes before pieces of ‘the Thing’ began to surface. There was no sign of Red Hill Jr. Above the thunder of the Falls, Red Hill Jr.’s mother, wife and children frantically called out for him. The vigil lasted through the night. His body was found in the morning near the Maid of the Mist dock. Following a public outcry over his death, a special order to the directors of the Niagara Parks Commission was issued to arrest anyone who commits an act of stunting upon the properties of the Niagara Parks. Since that day, no permission has been granted to allow any stunting within the park. But, of course, that didn’t stop them…they continued to evade the police and challenge Niagara, some over the brink, some running the rapids, some …. well, you take a look…. There’s few pleasures in life as soothing as a quiet ride in a kayak down a peaceful river with the birds chirping and the fish jumping. This is the last picture of Jessie Sharp, who chose to ride his kayak on the Niagara River on June 5, 1990, without a helmet or a life vest (he didn’t want to hide his face from the cameras). On June 5th 1990, the 28 year old bachelor from Ocoee, Tennessee and an experienced kayaker, attempted to ride over the Horseshoe Falls in a twelve foot long, thirty-six pound polyethylene kayak. Having planned the trip for three years, he brought a crew to video tape his journey. He confidently had made dinner reservations at the Queenston Park Restaurant, as his plan had been to continue riding the Niagara rapids after he successfully went over the Falls. Sharp was never seen again. 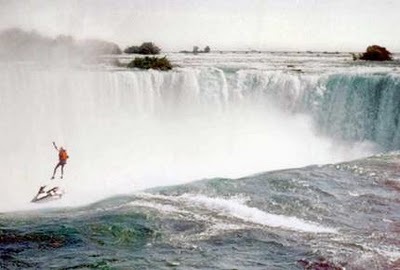 On October 1st 1995, Robert Overacker, a 39-year-old man from California, went over the Canadian Horseshoe Falls on a single jet ski. Entering the Niagara River near the Canadian Niagara Power Plant, he started skiing toward the Falls. At the brink of the Falls, Overacker ignited a rocket propelled parachute that was strapped to his back. His plan was that the rocket would quickly deploy the parachute allowing him to safely land in to river below the Horseshoe Falls where he could be rescued. Overacker did ignite the rocket which deployed the parachute as planned. Unfortunately as the parachute deployed it fell away from Overacker to the ground below. Unknown to Overacker the parachute was not tethered to his body. The parachute was not packed by Overacker prior to the stunt and he was unaware of this fatal error. 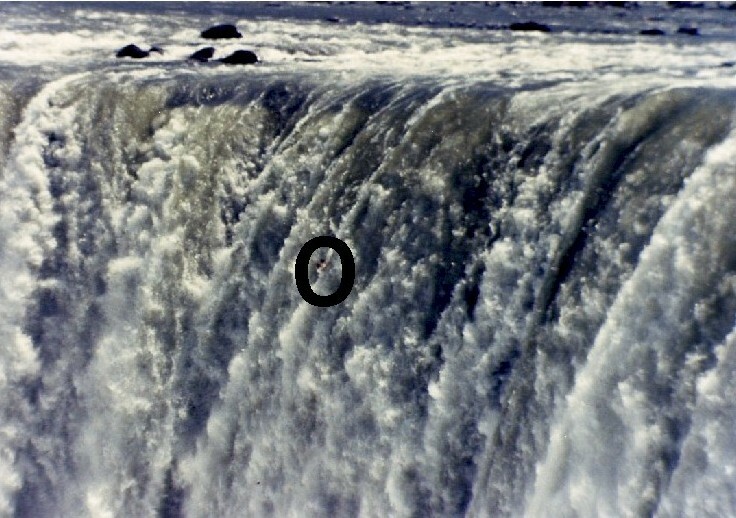 His step-brother and a friend witnessed this unfolding tragedy as Overacker fell to his death to the water below the Falls. Robert Overacker was married and had no children. Overacker became the fifteenth person since 1901 to challenge the Falls. He paid with his life. His body was recovered by staff at the Maid of the Mist. From jumpers to barrel riders – from rope walkers to skiers – Niagara Falls has attracted them all for almost 200 years. Officials say that they recover an average of 20 people per year who chose Niagara Falls to commit suicide, but there are those who choose to go over the Falls in the name of adventure or fame or fortune. The Niagara daredevils of today can’t compare to those of years gone past. The power of the mighty Falls has been sucked dry – bled away from the brink to power the unending thirst for electricity. Technology has removed the gadgetry of the daredevil and replaced it with scientific analysis and design. The odds of failure have been greatly reduced. Daredevils can be best summarized as persons who wish to take conscious risks with their lives. It’s all a question of odds. Some risks are so great that the odds of survival are so little that they become suicidal in nature. It may be a thin line between being a ‘daredevil’ and being ‘suicidal’. The definition of a daredevil is success. Fail and you’re suicidal – succeed and you’re a daredevil. The public doesn’t really care – they want to SEE it and hopefully SEE it FAIL! Most spectators come in the anticipation of a deadly outcome. Successful stunts are actually boring. 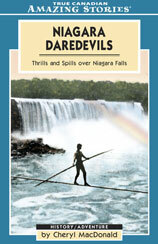 ‘Google’: ‘Niagara daredevils’ and you’ll find more than enough information and pictures to fill a scrapbook. Well – there you have it, all the thrills and chills and kills! Niagara is a wonder – and it has and always will beckon to the daredevil.